Your porcelain skin looks great, especially for your age. Our creams do not contain gluten. Our Tretinoin cream helps keeping acne under control and also speeds up diminishing of post acne spots. Do not buy our Infadolan ointment for dermarolling aftercare because in your case it could break you out but keep the treated area moisturized. You are lucky that your cystic acne does not normally leave scars. If you do have some scars from the past, buy a 1.5 mm dermastamp (not a dermaroller) and stamp the scars every three weeks. A 1 mm dermaroller (as you suggested) is a good idea for an overall facial care. When you have a severe outbreak of cystic acne, you should wait with dermarolling until it calms down a little. Just avoid dermarolling right in the middle of a raging outbreak. That is all. There is no damage to the skin. The problem is that lidocaine could have systemic effects if it gets into the blood stream and it is overdosed. Lidocaine is used systemically by doctors (at the dentists', aesthesia etc.) and there is no danger in topical application except if you apply a high percentage of lidocaine on really extensive areas, esp. on recently dermaneedled areas. OTC lidocaine topical anesthetics are not higher concentrated than 5%. However, we want to stay totally on the safe side and we warn our customers not to apply it in one go on extensive areas and also to wipe it off before any form of mcironeedling (microneedling highly enhances the penetration of products). Microneedling certainly does not cause Psoriasis but if you suffer from real Psoriasis (a serious skin disorder), you should not use any microneedling tools on affected skin. Dermarolling / Microneedling / Re: Can I use dermaroller and single needle on upper arms if I have excessive fat? Yes, unfortunately, women with polycystic ovary syndrome are often prone to overweight due to hormonal problems and if you are taking estrogen to balance the over-production of androgens, it makes it even harder. Not all women with PCOS are overweight so do not lose your enthusiasm. You will succeed. I think that you may get bruises even with a layer of fat because the blood capillaries are in the skin and the fat is underneath the skin. And if you have many stretch marks, it would be very laborious. >Would using dermaroller prevent new stretch marks? Dermarolling / Microneedling / Re: Derma-stamp/roll to thicken very thin under-eye skin? A 0.5 mm dermaroller is a good idea if you have uneven skin tone, post acne marks, uneven texture, clogged pores etc. but if you have acne scars, keep also using your 1 mm dermastamp. Yes, you can exfoliate about twice a week and moisturize your skin as much as you can. If you have scars only on your temples, buy a 1 mm dermastamp and stamp your scars every 10 to 14 days. If you get no results in six months, add our suction pump to your stamping sessions to release the tethering of the rolling type of acne scars. 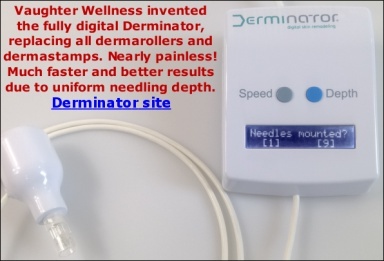 Concerning your knee scar, buy a 1.5 mm dermastamp with 35 needles. We sell Infadolan ointment for microneedling aftercare. You do not have pre-treat your skin in your case. It is completely normal that you are left with red marks after removing moles. If you would have had it done professionally, you would also be left with red marks because no matter how the mole tissue is removed, it must be removed and you are always left with a small lesion/injury that has to completely heal. Whether you burn it chemically (by acid) or thermically (by laser or electrocauterization), or you necrotize the tissue by freezing it (liquid nitrogen) the result is the same - the tissue gets destroyed and it has to heal and the inflammation has to fade. This can take some time. There is no need for expensive N light treatments. It will fade by itself. Concerning the redness (inflammation), try a topical non-steroid anti-inflammatory. Buy NUROFEN rapid capsules (it contains liquid ibuprofen) or NAPROXEN capsules, pierce a capsule and apply a little of the liquid several times a day on the red spot. Try it several times on one spot first to see what happens. Right after the application, the spot will turn more red but this should quickly subside. The anti-inflammatory substances may speed up the diminishing of the residual inflammation. You should definitely protect the red spots from the sun, since they have little to no melanin. A 1 mm dermastamp is a good choice in your case. 30k IU means 30 000 International Units. vit. E cream if you have good experience with it, concerning breakouts. It is not normal to have red patches a month later but long term redness sometimes happens in certain individuals prone to hyperpigmentation. You should apply your cream right after stamping (first wash the area with tap water) and then daily until the skin is back to normal. If you have dry skin, apply it several times a day. It would be great if can document your experience. I do not think you need the suction pump because it helps release the tethering of the rolling type of acne scars (they are usually tethered). It is worth trying in really stubborn boxcar acne scars, just in case that some of them are also tethered (boxcar scars are usually not tethered). You should use vit. C for at least 3 consecutive days prior to your microneedling session to achieve maximum concentration for the session day. Use copper peptides afterwards. On the days after, you can do turns. One day vit, C, the next day copper peptides and so on. During the same session, first stamp the scars and then roll the entire area. You can first roll and then stamp but rolling makes the skin red and you will not be able to see and precisely target the scars with the dermastamp. Do not treat your entire face in one go. It is better to do for example half of the face. When it heals, do the other. Avoid treating the pores next to your nose. Treat just your scars. You do not have to use Infadolan for more than right after the treatment but keep the treated area moisturized with a product that you know does not break you out. You can shower Infadolan off in the morning and apply your cream. You should do a small test patch to find out how long your skin remains red. Stamping with a 2 mm dermastamp is quite aggressive and it will likely stay red for at least two days and it will form scabs. Try it on Friday evening (if you do not work at the weekends). On the face, it is better to always stretch the skin while needling. Taking the magnification of your photo into account, there are almost no scars on your skin. I can see just a few scars. Dermastamping is very effective in the treatment of scars and your choice of a 1.5 mm dermastamp is good. Since you have just a few scars, I do not think you need a dermaroller. Unfortunately, I cannot predict how your skin will react to dermastamping. There is no other way than doing a small test patch. I am a little confused. Did the textural changes happen only in the burnt skin area or are you referring to your entire face? Or was the burn so large it covered a large part of your face? Burns heal very slowly and when the scabs fall off, the redness of the skin can last for months. Red marks left from breakouts can also take time to disappear. It is nothing unusual. Did you protect yourself from sun exposure after the laser treatment? >area that was burnt doesn't seem to have had improvements (again I know it is early days). Do I understand it correctly that she needled your entire face, not only the burnt area? What was wrong with the areas that were not burned? What exactly improved on them? Yes, it is too early to judge the results. I do not recommend adding home treatments in between your professional sessions either. I think that needling the burnt areas with a 1.5 mm needle, every 6 weeks is a good plan. I am sorry you experienced such reaction. None of those skin reactions are a standard reactions after mcironeedling, apart from flaking (not everybody has noticeable peeling though) but as I said, a few customers did report getting bumps or whiteheads (surprisingly, the reactions usually did not happen after the first treatment but after the third or so treatment) and it later disappeared. Do not use our Infadolan ointment on your face because it could break you out. You should clean your face after stamping with tap water and not with alcohol because alcohol may be irritating to the stamped skin. You can use any UVA + UVB sunscreen, protection 15 or higher. You should not stamp again until your whiteheads and bumps are gone. When you do stamp, stamp just a small area.